One of the few remaining pieces of undeveloped land within Brooklyn Bridge Park is barren no longer. 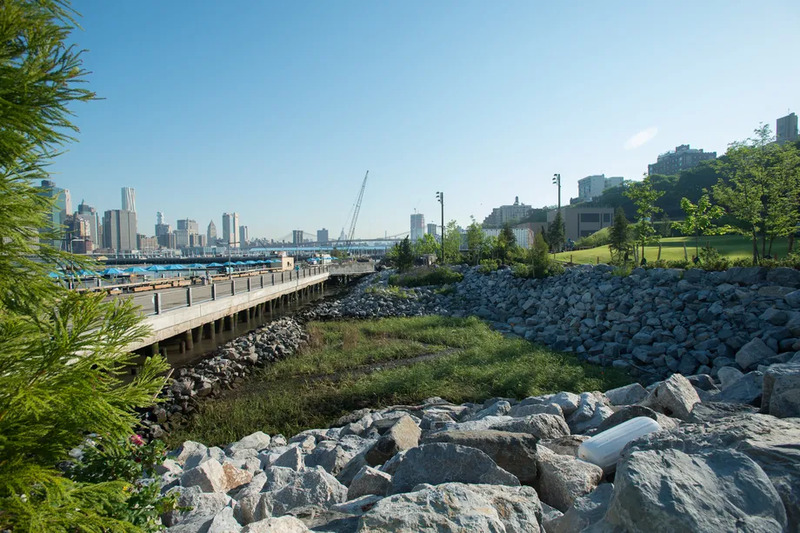 Today marks the opening of the Pier 5 Uplands, a chunk of green space located near the park entrance at Joralemon Street; its debut means that the transformative Brooklyn park is now 80 percent completed, according to the Brooklyn Bridge Park Corporation. “Today marks an important milestone for Brooklyn Bridge Park,” BBPC president Eric Landau said in a statement. The new section at Pier 5 covers 3.4 acres, and unlike the portion of the pier that’s closer to the East River—home to the Picnic Peninsula, with its myriad grills, as well as a huge soccer field—the Uplands are intended to be a “tranquil and expansive counterpoint,” according to Michael Van Valkenburgh, the landscape architect responsible for the park. The main features are landscaped rather than activity-based, and include lush lawns, a shaded grove, and a winding pathway through the space. It’s also notable for its 35-foot-long noise-dampening berm, which is intended to block the roar of the nearby BQE. (If you’ve walked by the park’s other berm at Pier 3, you know it’s pretty effective at doing its job.) A new entrance at Joralemon Street will connect the uplands to the park entrance, and a small bridge links it to the more activity-focused section of the pier below. But a few features of the full Pier 5 have yet to be realized; in the fall, the park will open a new entrance at what it calls the Montague Street Turnaround (between Piers 4 and 5), a boathouse, and a new operational building. An exact date for those is TBD. And there’s still one more portion of the park that’s in the works: Pier 3, which the BBPC envisions as a waterfront counterpoint to Central Park’s Sheep Meadow. Its defining feature will be an enormous lawn surrounded by walkways, and the design also includes a “play labyrinth” for kids, as well as a space that can be used for events or other recreational activities. Work there is also due to begin sometime in the next few months. Still, it’s been a productive few months for Brooklyn Bridge Park: In addition to Pier 5’s debut, the BBPC finally reopened the Squibb Park Bridge, which connects Brooklyn Heights to the park and had been closed for three years. The Pier 2 pop-up pool also returned for one more season just last week. Read this article on Curbed New York’s website.